These are used when setting up awkwardly shaped objects on the mill. The height can be adjusted up to suit. 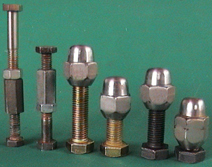 Lock nuts may be required for coarser threads, but fine threads (like wheel nuts) are, in most cases, ok without them. Shown are the 3-pairs I made. They demonstrate the range of adjustment in each case. Extra packing can be used under them if needed. They are simply put together with bolts that have had the heads machined flat (or domed or conical), the long nuts can be either coupling nuts or made from small hex bar (drilled & tapped). The domed nuts are just ordinary wheel nuts. It is probably better to use hardware that is grade-5 or above - stronger & more wear resistant. I found out very quickly that one of the hardest parts of milling is setting up the work accurately, ready for machining. Of course, the first thing is to use engineers-square, protractor, combination-square or dial indicator (plunger & finger types) with magnetic stand (I found you can't have too many of these around), to make the milling direction parallel to the x, y or z axis as appropriate. The next necessity is to be able to 'pick-up' where the edges of the work are & zero the dials. This allows us to then make accurate movements of the table/work relative to known reference points or edges. I have a wiggler to do this but I thought I would try my hand at making an edge finder to augment it. I now use the wiggler for some jobs, the centre finder for others & the edge finder for others - it all depends on what is the most suitable under different circumstances. I decided to make the 'business end' 5mm in diameter. The reason for selecting 5mm is that, one complete revolution of my feed screw is 2.5mm, hence, when the edge finder picks up the edge, its centre is 2.5mm away from the work edge - I can just zero the dial & one full turn would put the machines centre directly over the work edge. If your milling machine has a different amount per revolution of the dial, then just multiply this figure by 2 (or 4 etc). For example: English machines might have a screw based on 8t.p.i. (1/8" movement per turn), then the finished diameter would be 2 x 1/8" or 1/4". The length is just made to be the minimum convenient length - the shorter it is the better it works. Mine ended up being about 65mm long in the body & 33mm long for the end piece including a 15mm tip. The only materials I used were a 1/2" shaft from an old printer, a long slim spring & a small (<1/8") piece of shaft to make the pins, both from an old VCR. 1) The 1/2" shaft was centred in the lathe & the end faced off. 6) A through hole was drilled several mm from the end, ready for the thin piece of shaft which holds the end of the spring in place - as seen far left. Finished edge finder at near left. For general edge finding & small hole centre/edge finding. The Mk. II version is almost identical to the previous one. Body & parallel tip are the same, but a second pointed tip was made. The second tip goes on the opposite end of the body. A spring now extends from one tip to the other, instead of being fixed inside the body. Because I have a metric mill-drill & an imperial lathe, I made this tool to be 5mm Dia., but worked in inches while making it. I aimed for 5.000mm (=0.1969") but achieved 4.996mm (=0.1967) - I will accept the 2/10 of a thou error as OK. This edge finder works well, better than I expected it to. It probably doesn't equal the Starrett model, but theirs does cost a bit more. Addendum: I decided that the double ended one was too long to be held properly in my chuck, as the chuck only has a short grip length. So I have since cut it in half. Now it is two shorter units (of course I had to drill a new hole in each & use shorter springs as well).